Please see video examples, especially where equipment and props are used, for the clearest examples of what is required for each level. Broad Jump – A jump that is longer than it is tall. Length is handler’s choice.It is made up of at least two pieces, and the total length should be at least the height of the dog. At the handler’s discretion, a person might choose to use formal AKC broad jump boards, they might choose to use bars placed on the ground, or they may come up with some other creative way of creating a long jump! There is no minimum height, however the jump should have a maximum height of 8 inches. The jump cannot have uprights. Here’s a picture of an AKC broad jump for reference. Cone – A cone is usually a traffic cone of any size or it can even be a simple pole, if preferred. It is used to have the dog move away from the handler. The dog is often sent around this object to complete a 180-degree turn. Distraction – A distraction is something that the dog will find appealing. Because distractions vary by dogs, the distraction used should be the same as whatever is used to reward the dog. For example, if the handler uses hot dogs as the reward, then the distraction bowl should also hold hot dogs. If the handler uses a ball for the reward, then a ball would be used as a distraction. In some tests, the distraction is specified as food. Distraction Bowl – Any large and obvious bowl or plate used to hold treats/toys. It should be open and the treat or toy should be accessible to the dog. External Reinforcer – For TEAM tests, you may use a food reward/treat or a toy, such as a ball or tug, as an external reinforcer. External reinforcers are given as a reward for the behavior, after the exercise has been completed. Food Reward – A food reward is a piece of food. We do not define size, type, value, etc. Foot Target – A foot target is any square or circular object (piece of wood, upside-down food bowl, etc.) just large enough for the dog’s two front feet. It is used to help train dogs to pivot and to show position changes such as sit, down and stand. It is the handler’s choice to use it for front feet or back feet. It may be used wherever a platform is required. Front Position – “Front” is the position a dog assumes when facing the handler, with a straight body, perpendicular to the handler’s legs, and within six inches of the handler’s legs. Hand Signal – A hand signal is one continuous motion with one or two hands to indicate the required task to the dog. While the handlers may choose their hand signals, they may not “hold” a signal as an aid to the dog. As a general rule, a hand signal should always be completed within two seconds. Heel Position – “Heel” is the position a dog assumes when his/her head, neck and front leg area are close and in line with the handler’s left hip, regardless of whether stationary (sit, down or stand) or moving, and regardless of direction or speed (“heeling”). When judged, the exact position of the dog is less important than the consistency of that position, from start to finish, with the dog maintaining obvious focus on the handler at all times. It is competition heeling and not loose-leash walking. The dog’s head carriage should be up, but not necessarily looking at the handler’s face. If the handler’s country of origin traditionally allows for contact, then that is appropriate for TEAM as well. Otherwise, a slight gap between the handler’s leg and the dog is preferred so that the handler may move unimpeded. Multiple Cues – In exercises where behavior is cued, only one cue is allowed. That single cue may include both a verbal AND a hand signal (see individual descriptions to clarify) but the cues cannot be repeated more than once. For example, if you cue your dog to sit, and if your dog does not respond, then a second cue will cause the exercise to receive a “not yet” designation. Work hard to train your dog to respond to single cues! Platform – A platform is a piece of material that your dog can put all four feet on and then proceed to sit, down or stand at your request. It should be large enough for your dog to work comfortably but narrow enough that it will structure a straight sit; however, we will not specify the dimensions, so find something that works for you. Your platform can be a mat if preferred. A PVC box can also be used instead of a platform. 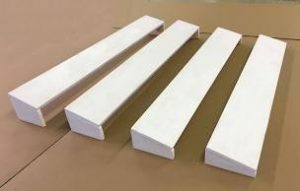 PVC Box – A PVC box is a square frame made of PVC that is placed on the ground. Your dog can sit, stand or down inside of it, and your dog is directly on the ground. It can be used interchangeably with a platform, so anywhere you see “platform,” you can use a PVC box or a mat. Target – Target is the generic word for an object that the dog uses to either go a distance (such as a cone, mat or pole), place front or rear feet (such as a square or disc), place all four feet (platform/PVC box), or any object that the dog can touch with his/her nose or paw, such as a target stick, a piece of tape on any vertical object, or a hand. If only the word “target” is used, any of these options is acceptable, although in almost all cases the exercise will specify. T.E.A.M. – TEAM stands for Training Excellence Assessment Modules. Toy – A toy is any object that your dog might enjoy as a reward. A ball, tug toy, or stuffed toy are all examples of toys that may be used for reinforcement. If you use a toy, your reward period must be ten seconds or less, from the time the dog actually takes the toy until you have it out of the dog’s mouth. Treat – A treat, or food reward, is a piece of food. We do not define size, type, value, etc. Trick – Anything that is traditionally done just for fun is a trick. Examples might include wave, spin, sit up, speak, stand on back legs, head flat on the ground, etc. Use your imagination! It may not include anything that is tested in the levels, such as backing up. Verbal Cue – A verbal cue is any word or set of words that you use to instruct your dog to do a specific task. It may be preceded by the dog’s name if the handler wishes. Cues should not be excessively drawn out. Verbal Cue and/or Hand Signal – When this is specified on a level, handlers may use both a verbal and a signal cue (see definitions) given together. If used together, the verbal cue and hand signal must be performed simultaneously or they will be considered multiples cues.